Wash and scrub the potatoes to remove all the dirt. Make pin pricks all over the skin and boil in slightly salted water for 3-5 mins. Drain. Wipe with a clean n dry kitchen towel. With the skin on, cut out thickish, even sized wedges with a sharp knife. Preheat oven to 160 deg C. Line a baking tray and slightly grease it. Bake for 12- 14 mins, turning them once over, till the skin turns golden brown and crisp. Fries are a favorite with adults too..and specially if they are with skin...you cant resist. .absolutely hit one Kalyani. 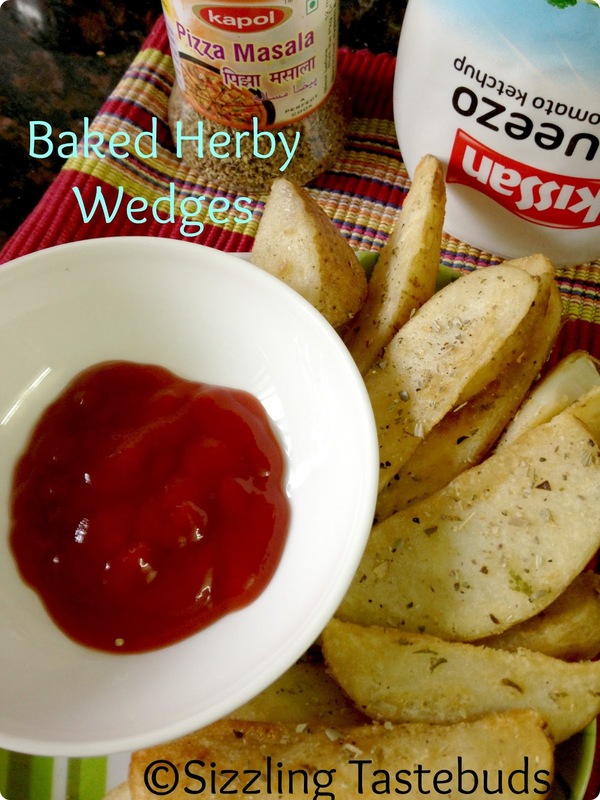 A prefect guilt free wedges to enjoy, love to munch anytime. I would love this too!..bring them on ok.. I have to try this Kalyani. My kiddo loves these .Looks so inviting! Guilt free potato wedges !! Looks very delectable ! Love the baked version of the fries. Guilt free and loaded with flavors. Looks very inviting! Nice and yumm! A perfect comfort food. Sure, French fries/ potato wedges.. No kid or even adult would say NO to these. They look crispy and yummy!! these are always a party hit!